Cystic fibrosis transmembrane conductance regulator (CFTR) is the essential chloride and bicarbonate channel in the apical membrane of epithelial cells. CFTR was also proposed earlier to conduct glutathione (GSH) out of airway epithelial cells to be enriched in the apical airway surface liquid to neutralize reactive oxygen species (ROS). Although earlier studies suggested that release of GSH by wild type (wt) CFTR may lead to an increase in cytosolic ROS, we did not detect different ROS levels in cells expressing wt-CFTR and mutant F508del-CFTR, independent of CFTR-activation or exposure to the ROS donor tert-butyl hydroperoxide. The Ca2+-activated phospholipid scramblase and ion channel TMEM16F (anoctamin 6, ANO6) is also expressed in airway cells. 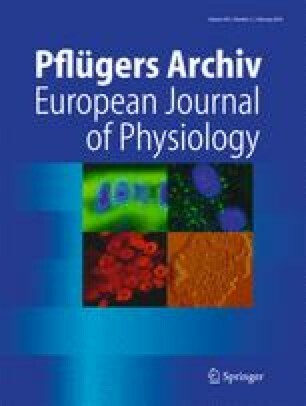 ANO6 produced outwardly rectifying Cl− currents (ORCC) and scrambled plasma membrane phospholipids when activated by increase in cytosolic ROS and consecutive peroxidation of plasma membrane lipids. ANO6 activity is enhanced by CFTR, probably through translocation of signaling proteins to the plasma membrane. The present data suggest that enhanced cell death in CFTR-expressing cells is due to upregulation of ANO6-activity. In ANO6 knockout mice, the number of apoptotic cells in the intestinal epithelium was strongly reduced, supporting the role of ANO6 for cell death. Thus, ANO6 and CFTR act cooperatively on ROS-mediated cell death, which is not further augmented by cAMP-dependent stimulation. We propose that ANO6 supports cell death correlated with expression of CFTR, possibly by inducing ferroptosis. The online version of this article ( https://doi.org/10.1007/s00424-017-2065-0) contains supplementary material, which is available to authorized users. Supported by DFG SFB699-A7/A12, DFG KU756/12-1, and UK CF Trust SRC003 INOVCF.